Thursday – Transfer deadline day. “We must get a striker” has been the mantra for months so when the man coming in on loan was announced as being Jerome Sinclair from Watford there was uproar from some. He’s made eleven league starts at various levels and come on nineteen times, scoring just one goal. By the way that was for Sunderland and set up by Chris Maguire. Because of that record, in an instant we had some supporters on social media saying it was dreadful news and that we’d signed “another useless ****”. Er, why not watch the guy play first before passing judgement? Would that not be sensible and also fair? It’s the term striker that I think is often bandied about unfairly and does certain players no favours in the eyes of some, who I think may just be a little blinkered. What’s the difference between a striker and a centre forward? Traditionally a striker is expected to operate in and around the penalty area, getting into space to enable team mates to set him up and also anticipating chances. In short he’s there to primarily score goals. A centre-forward is expected to be much more involved in a team’s build up play. Think Ryan Taylor and the debate surrounding him when he was with us. A fair few had him down as a waste of space as he didn’t score many goals. I couldn’t care less who scores our goals as long as we get enough of them. Full-back, centre-half, midfielder what does it matter? Not for the first time I’m now going to argue that we’ve got bigger problems keeping goals out than scoring them ourselves. That’s what the stats say. An average of 1.28 goals scored per game makes us attacking wise the 12th best in the division. Defensively we rank 19th having conceded an average of 1.59 per match. I’ve no idea whether Sinclair is really a striker, a centre-forward or just a forward and realistically there’s probably a blurring between these categories when it comes to most players. What I do know is that we need another option to Jamie Mackie to play as the “focal point” up top. We lack bodies but if it was just another body that was required, as my son pointed out, we would have kept Sam Smith. It will be interesting to see what role Sinclair is assigned and what KR and the coaching staff are expecting him to deliver. I’ll reserve judgement as I will on Jonte Smith. He signed on Friday until the end of the season. With a deadline day deal not being agreed we’ve only got him thanks to Lewes kindly letting him leave them by mutual consent to become a free agent. He’s now contracted with us until the end of the season. 56 goals in 121 games is a good scoring record but Lewes are a Bostik Premier Division team. The step up is massive. Good luck to him and Sinclair. Welcome to OUFC. Something which does look like a real positive – okay it’s building for the future and not sorting out the here and now or ensuring the next tax bill is paid, but bringing in Gareth Hamer as the Head of Academy Recruitment should bring big benefits down the line. Having proven, after a fashion, that our attack is better than our defence, the reverse very much happened here – just like saying player x is having a superb game when he then immediately makes a complete balls up. Best to keep one’s mouth shut and never spout an opinion about football? That way you’ll never get caught out. This was the first clean sheet we’d kept since the home win against Blackpool on 15th December, eight league games ago. There was nothing lucky here about this achievement. The back line were excellent with the Brewers hardly having an effort on goal. I can’t think of an afternoon where Simon Eastwood has had so little to do. That they had so little going forward throughout the game was probably largely down to the fact that they were reduced, and rightly so, to ten men after just 12 minutes. Up to that point we’d played the football with a goal looking quite likely to come. Burton were penned in their own half. Thereafter I didn’t think our level of threat increased. It was therefore a major disappointment that with a man to the good for the vast majority of the game we couldn’t conjure up even a single goal. I will though give Burton huge credit for the way they reacted to adversity. They kept a solid shape, defended excellently and had a real desire to take a point. They were never going to go gung-ho but if an opportunity were to present itself they clearly had an eye open ready to take all three points. When he came on Marcus Harness looked like, given half a chance, he could punish us. However, as we were sound enough at the back, no such opportunity came his way. 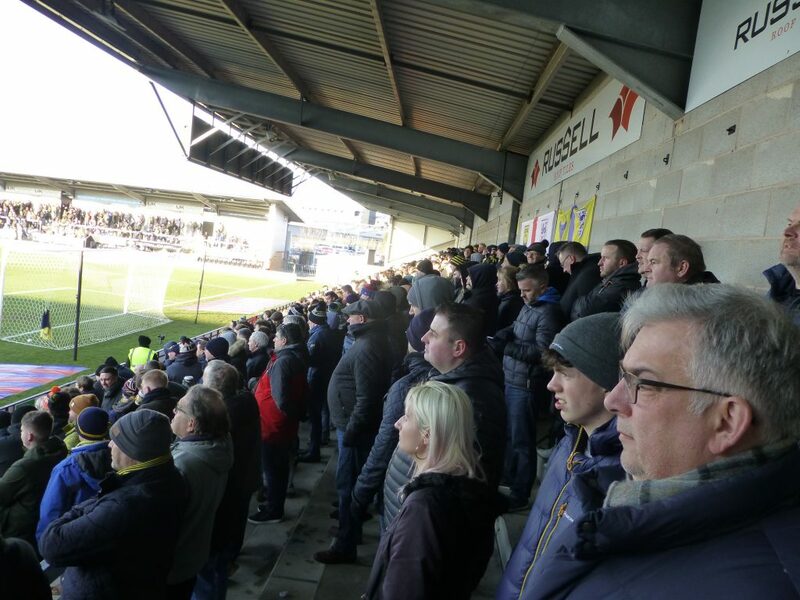 With Burton playing as they were patience was the name of the game but I had a feeling long before the final whistle that we were not going to win – in marked contrast to my pre-match optimism. I’d thought today was the day. It goes without saying that this was a golden opportunity to chalk up our first away league win. That we weren’t capable of doing so makes me think there’s a pretty good chance we’ll go the whole season without being victorious on our travels and that is a massive worry. Nevertheless we didn’t play badly. Like our opponents we had good shape. We knocked the ball around reasonably well but for all our possession we just didn’t have a cutting edge. There were way too many high balls into their box where the Burton centre halves won just about everything in dominant fashion. We’d looked really menacing from corners against Barnsley but not so here. That could be down to a decline in the standard of delivery or Burton’s defence being better than that of the Tykes. Our most likely route to goal was to play on the deck but with home numbers back this wasn’t easy. When we did play balls into the box they often ended up with keeper Bradley Collins gathering with little fuss. That’s down not only to his anticipation and good positional sense but also the low quality of delivery – or perhaps that we had no one reading the situation and getting on the end of things in true predatory striker style. So having now seen him play, time to talk about Sinclair. Naturally, as I would with any player making his OUFC debut, I wanted him to do well. And given the social media abuse he’d received more so than normal. What better way of sticking up a metaphorical two fingers than picking the ball up, beating three or four players and then hammering a screamer into the back of the net. Instead the first JS memory I’ll have is of him just a few yards away from us attempting to play a cross into the box with one foot but instead of doing so accidentally knocking it out of play with the other. A complete hash. It was all too hurried which I’ll put down to being too keen to impress on his first outing in an Oxford shirt. Approaching the half hour mark he was put through by an excellent diagonal ball from James Henry. I held my breath as we were about to see if he is a proper finisher/striker. He took one touch and then lashed it hopelessly off target. Oh dear! This wasn’t good and based on the 78 minutes he played it’s hard to envisage him hitting the target very often, but he did contribute. He looked quite quick and mobile and the way he stayed just onside to allow Henry to play that pass to him was pleasing. He’d also gone speeding past a static John Brayford in the incident which led to the Burton man being given his marching orders. It was a definite red. A pull of the arm and down he went. If Brayford had already had the pleasure of witnessing JS’s finishing he may well not have bothered. There were also a couple of times when he dropped back a bit and showed for the ball before taking a touch or two and then playing a simple pass to a colleague, whom he’d hardly know. His wasn’t the worst performance I’ve ever seen by an Oxford player but for someone who cost £4m less than three years ago we should be expecting more. There are 16 games left in which to shine. John Mousinho was withdrawn at half time with Karl Robinson’s logic being that we didn’t need a holding midfielder against 10. The only reason I would have taken Mous off was because he was on a booking. Label him what you will but he’s an intelligent footballer who, although not the most inventive, can certainly play a pass. With both Sinclair and Jamie Mackie together on the pitch we hadn’t turned into a goal machine of a football team. If we’d managed to have got the ball over the goal line just once we would now be 18th in the table. As it is we’re now back in the bottom four. It’s getting to the time when draws are not really good enough. Since that Blackpool victory we’ve only picked up seven points in the subsequent eight games. That’s relegation form and we can’t pretend otherwise. We can’t blame bad luck or the officials for not winning. In fact I thought Brett Huxtable, although not the fittest of officials, put on one of the better refereeing displays I’ve seen in a while. Other than the dismissal I thought he was absolutely correct in booking David Templeton for diving. That type of incident can often go against you. It could be argued that we got away with one in the 76th minute following a poor back pass from Rob Dickie. It may well have been a foul by Liam Boyce but if one of our forwards had not gone for such a ball in similar fashion I would have been disappointed. Perhaps a yellow card was harsh but in this day and age that’s usually the outcome. Well done to Eastwood for his bravery. As the foul was given, the fact that he was about to gather a back pass didn’t come into consideration. I wonder what would have happened if Boyce had just pulled out and allowed our custodian to gather? Dickie didn’t have the best of matches and there were times when the ball was at his feet that he had me thinking he’s not L1 standard. He would then though get stuck in and win a challenge so not all bad. This result has increased the distance between us and the very bottom slot by one point but second bottom Shrewsbury, who have plummeted again after recovering from a terrible start to the season, only have one less point than us. Plymouth look like they’re playing their way out of the mire and Rochdale and Bristol Rovers both won on Saturday to take them out of the bottom four. It’s incredibly tight in the bottom half of the table and it obviously isn’t an understatement to say that we’ve got many crucial games coming up between now and that visit on the final day of the season to Kenilworth Road. Like every other outfit we’ve got to go with the squad we’ve got. Is it good enough? Possibly. Will KR use them wisely to bring home the points? Possibly. Yet again I feel obliged to say that we do have some very good footballers at our club. No doubt our rivals do too. Against Burton there were moments when I thought Henry and Jordan Graham looked classy. Samir Carruthers got a few minutes and hopefully will get better and be able to bring something to the cause in the final third of the season. Marcus Browne should be back next game and hopefully refreshed. I’m sure we’re in for an extremely emotional and tense remainder of the campaign. 1440 squeaky bum minutes. If we come through it still a L1 team for 2019/20 I’ll love it. If we don’t I’ll hate it all. Meanwhile a loyal bunch of travellers will continue to follow the U’s north, south, east and west until the very end. 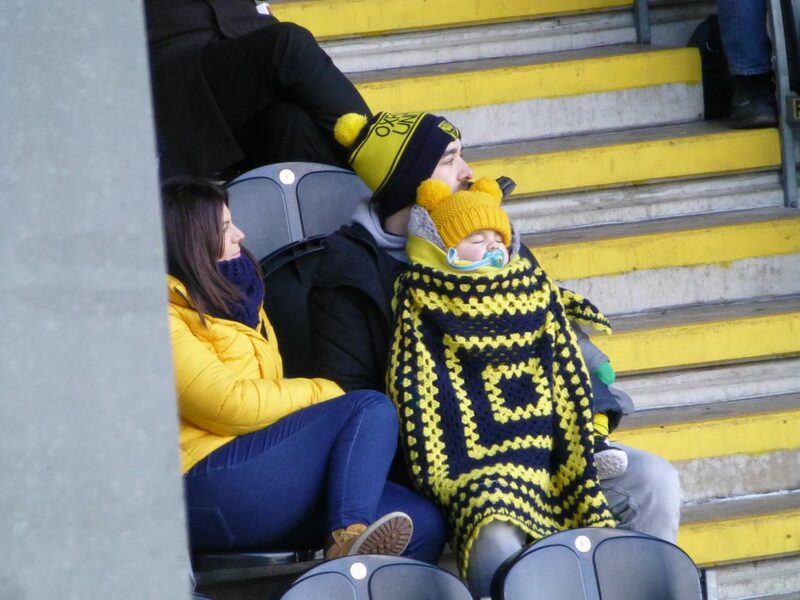 Oxford fans provided over a quarter of the attendance at the Pirelli Stadium. It’s the football first and foremost that takes us here, there and everywhere but going to a place like Burton which is all about brewing is a bonus. I’ve missed the Coopers Tavern, one of the best pubs around. The Roebuck and the Derby Inn were decent enough too. Another thing I do know is that the players won’t give up without a fight. There’s spirit and experience in the team. But is that enough? Only time will tell. This entry was posted on Sunday, February 3rd, 2019 at 2:50 pm and appears under News Items. Both comments and pings are currently closed.